Makeup Revolution - Revolution x The Emily Edit "The Wants" Palette ~ Swatches, Review and 5 Looks! I'm such a big fan of Emily Noel on youtube - she is just a true, authentic beauty lover who seems so genuine and honest in her videos! I always trust her thoughts and reviews to be real. She is super hard working and just brings a real positive energy to her videos! So, when she announced that she was creating a palette with Makeup Revolution, I really wanted to support her. Also, I have never actually tried any makeup from Makeup Revolution as it hasn't really called to me before; but, Emily talks about it a fair bit so it seems like a good collaboration! Makeup Revolution is an affordable drugstore brand - I've seen it in Canada at London Drugs; but, I'm not positive if this particular palette will be coming to stores in Canada. I purchased on the Makeup Revolution website and only spent $7 on shipping and it shipped fast! 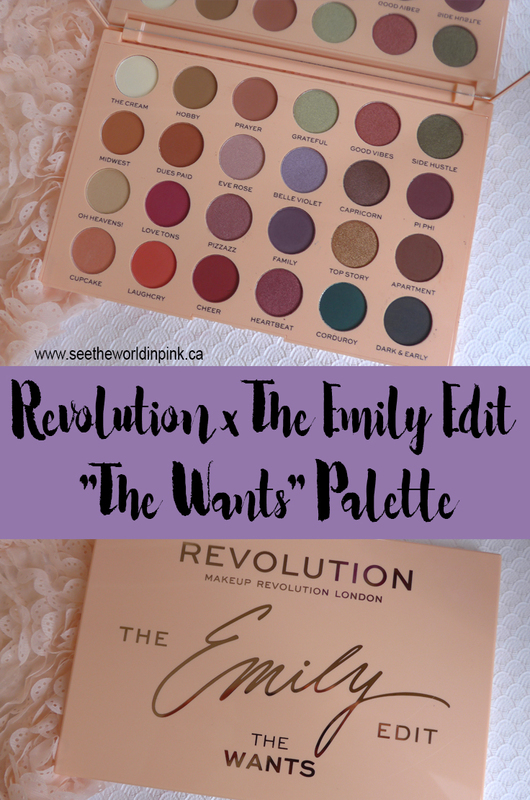 Makeup Revolution - Revolution x The Emily Edit "The Wants" Palette ~ $20.00 US. An eyeshadow palette you'll want to use everyday! Created and crafted with content creator Emily Noel, aka Beauty Broadcast, The Revolution x The Emily Edit - The Wants Eyeshadow Palette features 24 matte, satin and shimmer shades. This palette is really pretty - it's actually really different than what I have in my collection! I don't often reach for cooler tones, purples or greens; but, this is really great way to try them out! Emily created this palette to have a good balance of light, medium and dark shadows that is meant to be buildable to reach the intensity that you like. The palette is meant to be inspiring as well as allow you to be in your comfort zone as well. I think that's a great way to describe it! Overall, the shadows are really pretty! The formula is nice and I personally prefer a shadow that is more buildable as opposed to one that applies super pigmented. I found the mattes applied well and blended really easily on the eyes, especially the lighter colours. The darkest mattes (Family, Corduroy, and Dark & Early) took a little more time to blend out; but, looked really pretty after the blending. The shimmers applied best with a finger tip and looked pretty on. I used The Cream as a base over the whole lid, Midwest through the crease as the transition shade, Dues Paid to deepen the crease, Top Story all over the lid, Pi Phi patted on the outer corner and Oh Heavens! in the inner corner and under the brow bone. 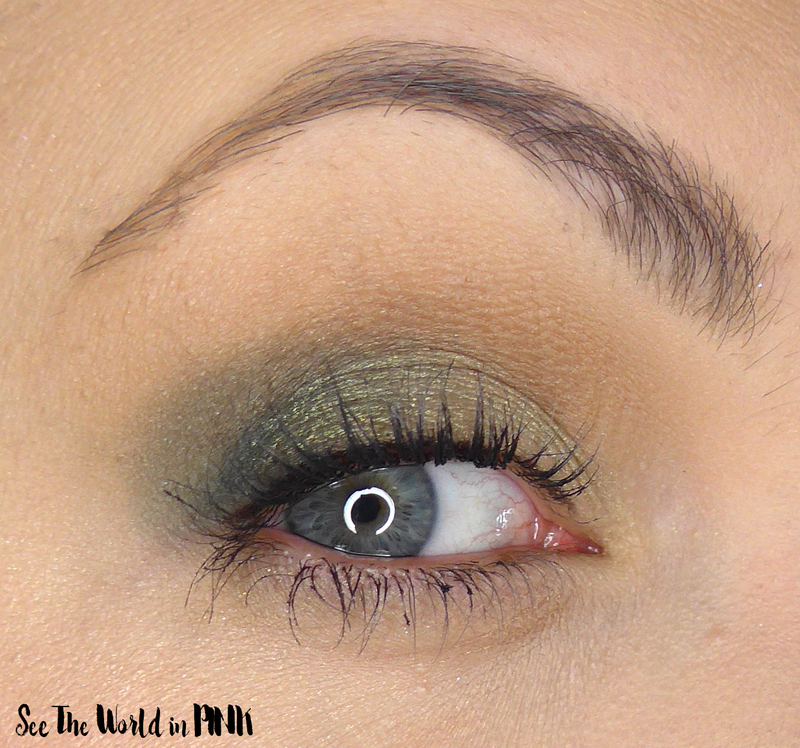 This is totally my comfort zone shadow look - it was so easily to put this together and it wore beautifully! I used The Cream all over the lid as a base, Hobby through the crease as a transition shade, Corduroy to deepen the crease, Grateful all over the lid, and Side Hustle on the outer corner. I rarely reach for greens, so I love that this palette has lots of options. It is nicer to have multiple greens to use together as opposed to a random single one in a palette. For this look I used The Cream all over the lid as a base shadow, Prayer with Midwest through the crease, Laugh Cry to deepen the crease, Cheer in the outer corner, and Cupcake on the inner lid and Hearbeat on the outer lid. Also, Oh Heavens! is under the brow. This is a fun pinker, peachier look - I love these colours and don't wear them as often as I should! For this look I used The Cream all over the lid as a base shadow, with Hobby through the crease and Family to deepen the outer corner of the crease. 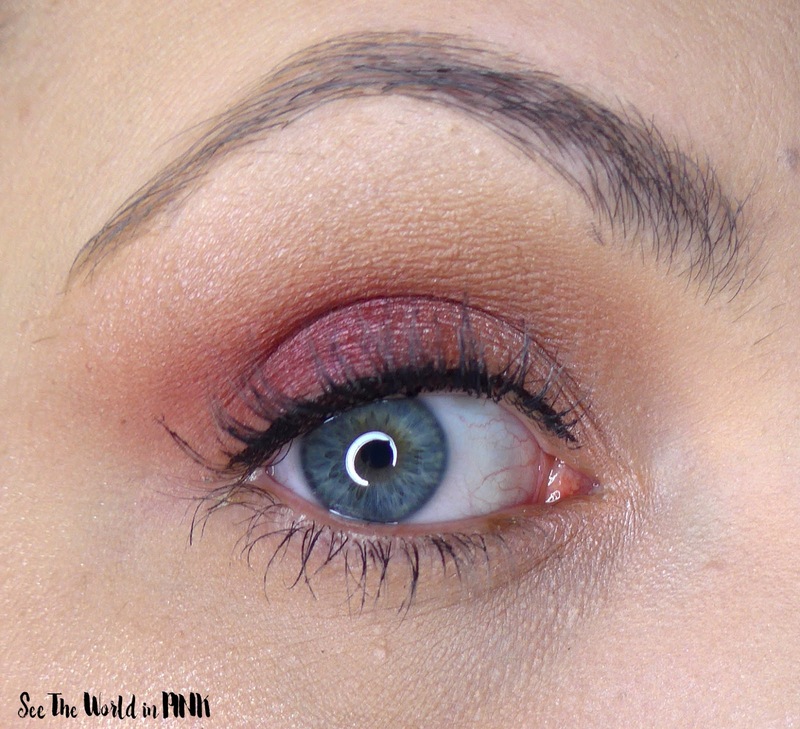 I added Belle Violet all over the lid, with Eve Rose on the inner lid. Please ignore my very tired 5:30 am eyes - I love the purples in this palette. I always try purple shadows and can't ever find a formula that I really enjoy and these worked so well. I used The Cream all over the lid as a base shadow, and Midwest through the crease, with Dues Paid to deepen the crease. Then I Capricorn on the outer corner, with Good Vibes on the outer on top of it. The lid is Pizzazz, Cupcake and Eve Rose. This is my favorite look of all 5 - it look a little more time to build up the shadows and layer them; but the results are so unique and pretty! And, here is a full look with the final eyeshadow look! Overall, I was impressed with the wear of the shadows - I used them with and without primer and thought the wear time was great without primer as well. I haven't played with really deep looks, as all 5 of these looks were for work; but, I love the amount of versatility I was able to get with it! I can't compare this to any other Makeup Revolution shadow formulas, as this is the first palette I have tried. I wouldn't say it's the best formula that I have every tried; but, for 24 shadows for $20, there wasn't a dud in the palette. Some applied a touch easier than others; but, overall the shadows were very workable and created really pretty looks! Although the colour selection in this palette is not really my cup of tea (it's very DEFINITELY very Emily though! 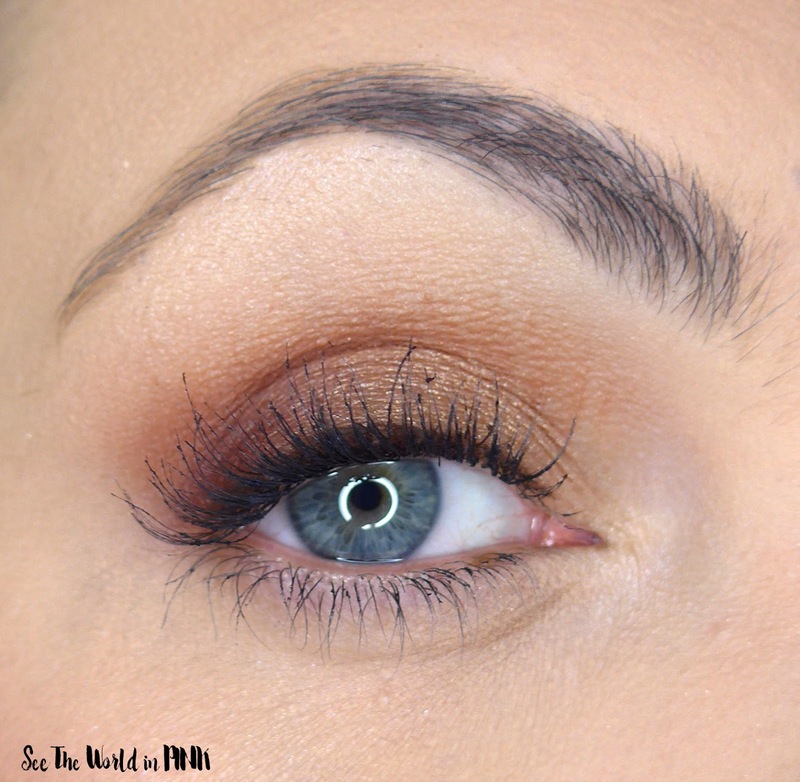 ), I love, love, LOVE the looks you put together using this palette. And holy your lashes... they're unreal!!!! Thanks Chelle! It wasn't my regular color scheme either; but, I like that's it's different in my collection! I'm liking the colours in this palette as they're definitely shades I would go for (give me cool shades all day any day). Also love the looks you did, they're all looks I would love on myself as well! Thanks Chantal! I was pretty happy with the looks too - I love that it's affordable too! Wow that's an amazing palette for a great price! The colors look fantastic on you. Thank you - I'm so happy with the palette! Whoa all the colours look fantastic on you! Thanks so much! Not what I normally reach for, so it was fun to use! I love the neutrals the best too! I love how versatile this palette is. What a good buy! Yes - so versatile and such a great buy!!! !